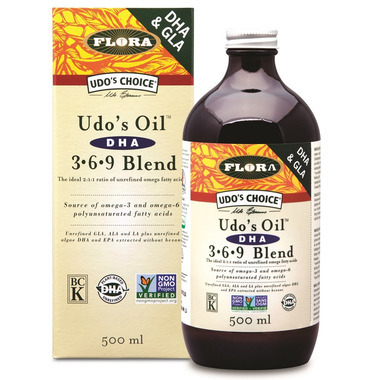 Udo's Oil™ DHA 3-6-9 Blend is an excellent vegetarian source of algae-derived DHA (docosahexaenoic acid). This omega-3 fatty acid supports the proper functioning of our brains as adults, and is needed for normal physical development of the brain, eyes and nerves, primarily in children under two years of age. Shake bottle gently. 1 tablespoon 1-3 x daily with meals. Organic flaxseed oil, organic sunflower seed oil, organic sesame seed oil, organic evening primrose seed oil1, algal oil (Schizochytrium sp.2), organic coconut oil, organic rice bran oil, organic soy lecithin, rosemary extract*, high oleic sunflower oil, tocopherols*, ascorbyl palmitate*, organic oat bran oil. For optimal freshness, KEEP REFRIGERATED. Do not heat or use for frying. Once opened, consume within eight weeks. Great product! Helps in overall well being. Makes your brain work better, and skin look healthier. Great quality, but I'd prefer a capsule because I don't make a smoothie every day so I only take this a couple times a week. I do appreciate that it's vegan and has no aftertaste. I love the way it tastes! Easy to consume. Easy to consume, no fishy taste or burps and so darn healthy! No fishy taste, blends in nicely with my greek yogurt and smoothies!